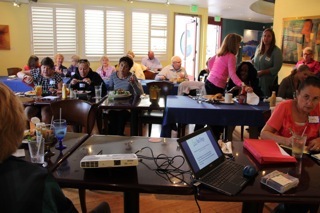 The Clairemont Dems’ Monthly Club meeting in June was a huge success!! Members gathered at 6:00 p.m. to socialize and grab a bite to eat from Boomerang’s. 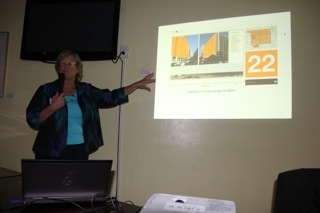 At 7:00 p.m., Club President, Dr. Jen Campbell, kicked off our meeting. 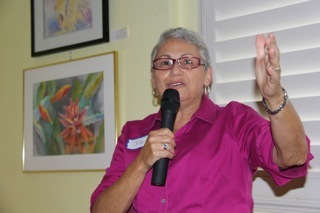 Club member, Carol Kim, announced that she will be running as a Democrat for San Diego City Council District 6. Club member, Phyllis Mathis, expressed the displeasure of Clairemont residents regarding an attempt by developers to rezone an area of Clairemont near Genesee and Balboa Avenues – right across the street from residences – to allow for a drive-through restaurant open until 1:30 a.m. 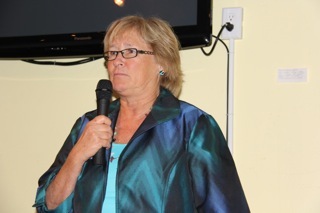 Finally, the keynote speaker of the evening, prominent local attorney, Pam Wilson, addressed the club. Wilson is a leader of the coalition called Scenic San Diego, which works to keep our environment beautiful. Wilson sounded the alarm bell about a billboard company lobbying our City Council to put commercialized billboards up in the downtown area. 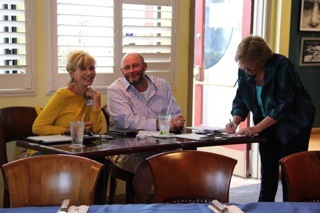 Secretary, Christine Becker, and Membership Chair, Kurt Bassett, check-in meeting attendees. Club members socialize and dine on gourmet burgers prior to the start of the meeting. 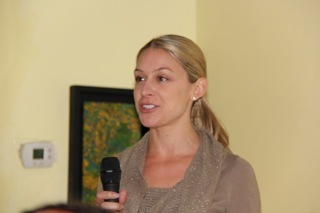 Club President, Jen Campbell, kicks off the meeting. 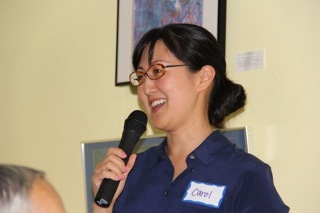 Club Member, Carol Kim, announces her candidacy for San Diego City Council District 6. Club member, Phyllis Mathis, expresses displeasure of Clairemont residents regarding an attempt by developers to rezone an area of Clairemont near Genesee and Balboa Avenues – right across the street from residences – to allow for a drive-through restaurant open until 1:30 a.m. 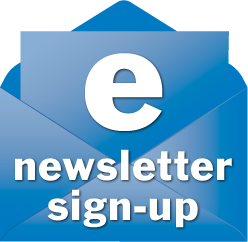 Check out http://www.careaboutclairemont.com to hear more about it with a short video. 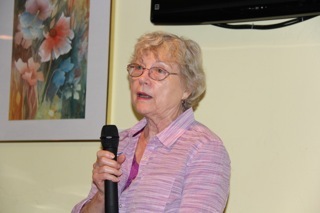 Prominent local attorney, Pam Wilson, a leader within a coalition called Scenic San Diego, which works to keep our environment lovely, addresses club.